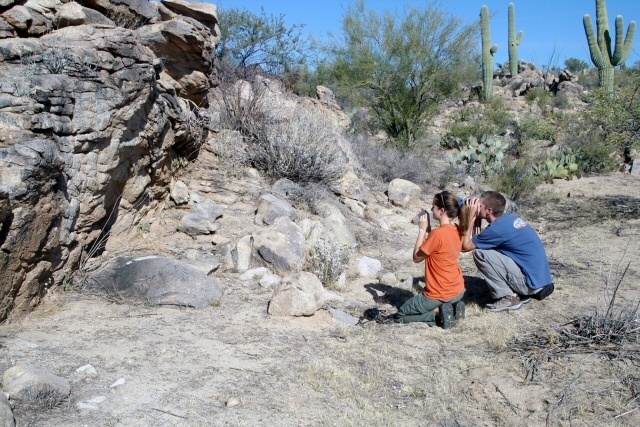 The following is reprinted from the Sonoran Herpetologist, the Tucson Herpetological Society’s membership publication. See the original here. On the evening of 10 November 2016, the nine previous recipients of the Jarchow Conservation Award (JCA), James Jarchow, Roger Repp, Cecil Schwalbe, Dennis Caldwell, Phil Rosen, James Rorabaugh, Don Swann, Erika Nowak and Taylor Edwards, met to discuss the merits of six nominees to receive the award. (Dave Hardy, Sr., received an excused absence, and a toast was raised on his behalf). The decision was difficult, as the qualifications of all nominees were each staggering in their own right. There were no secret ballots, and the voting did not occur until the strengths of each candidate were thoroughly discussed. Sadly, in the end, only one award can be presented at a time. The JCA Nominating Committee is pleased and proud to announce that Jeff Smith and Melissa Amarello are the next recipients. The award ceremony, which will highlight their achievements in proactive conservation measures of snakes in general, and rattlesnakes in particular, will be held in late February of 2017. The exact date and location of the ceremony has yet to be determined, but will be well broadcast via the THS email list as well as the website. Jeff Smith and Melissa Amarello in their natural element, photographed by Young Cage. The reasons that Jeff and Melissa have received this award are many, and will be brought to light at the ceremony. Greatly simplified, after over a decade of on-the-ground studies, they had an epiphany. They realized that no amount of data on how to conserve snakes mattered without public support, and that despite our collective knowledge of the negative attitudes of the public toward snakes is widely known, there was no organization or movement in existence to actually promote snakes in a positive light. Armed with their on-the-ground knowledge of the social aspects of rattlesnakes, they formed the nonprofit organization Advocates for Snake Preservation (ASP). Since that time, they have made a number of public presentations and multi-media blitzes to educate the public about the importance of snake conservation, and dealing with the absolute environmental travesty of rattlesnake roundups. Everything they do in this regard is “for the snakes.” The JCA Nominating Committee sincerely hopes that you will attend the festivities held to honor their effort. Stay tuned for details.